Does Denver's front office ever get a lunch break? On Monday, the Broncos announced that seventh round draft pick (234th overall) Zac Dysert had signed a four-year deal with the team—leaving only their top three draft picks (Sylvester Williams, Montee Ball, and Kayvon Webster) still unsigned. On Tuesday, news broke that the team has scheduled a visit with free agent defensive back Charles Woodson, a 36-year-old veteran defensive back. CBS4's Vic Lombardi was the first to report the news. Woodson's agent, Carl Poston, told ESPN's Josina Anderson that the cornerback/safety hybrid is flying to Denver today and will meet with them through Wednesday. The likelihood of Woodson landing with the team seems to be high, considering that the interest is mutual. Woodson is a sixteen-year veteran who spent the first two stints of his career with the Oakland Raiders and most recently the Green Bay Packers. 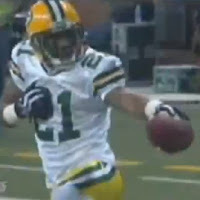 An eight-time Pro Bowler, Super Bowl champion (XLV), and Defensive Player of the Year (2009) winner, Woodson would add nice depth to the team's secondary. If the veteran does land in Denver, expect him to push fellow veteran Mike Adams for a starting gig. A versatile player, Woodson can play multiple positions in the secondary. Another report surfaced on Tuesday that the team is also talking with free agent middle linebacker Brian Urlacher. That report, however, is false. The Broncos have debunked their reported interest in Urlacher through 104.3 The Fan, CBS4 Denver, the Denver Post, and ESPN. As of now, Urlacher is not in Denver's plans. But Woodson has caught their eye. As Denver continues to build the pieces necessary for a Super Bowl run, signing Woodson to a one-year deal may be the next step. Stay tuned.